Melt white chocolate and set aside to slightly cool. Line an 8-inch cake pan with parchment paper so sides and bottom are covered and ends are hanging outside the pan to lift out the cake later on. Press parchment to form around the inside of the pan. Place halved ladyfingers vertically side-by-side around the inside of the cake pan (rounded sides facing the side of the pan). Form the bottom crust by placing one layer of ladyfingers on the bottom of the pan, cutting pieces to fit if necessary. In a medium mixer bowl, beat cream cheese on lowest speed of electric mixer until smooth. Blend in sugar and melted white chocolate; mix together. Pour lime juice into small saucepan. Sprinkle gelatin on top of juice; let stand 5 minutes to soften. Stir mixture over low heat until gelatin is dissolved. Blend warm gelatin and lime zest into cream cheese mixture. Fold cheese mixture into whipped cream. Spoon mixture into ladyfinger lined pan. Chill for at least 3 hours. 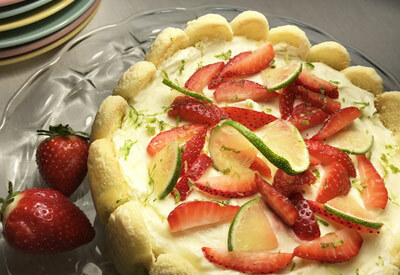 Just before serving, garnish with sliced strawberries, sliced lime and lime zest.